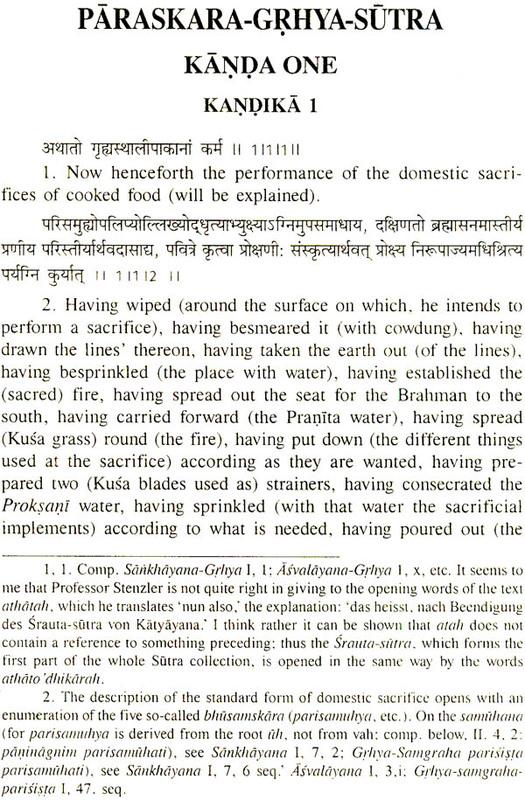 The Grhya Sutra of Paraskara which belongs to the white yajurveda and forms as appendix to Katyayan’s Srautasutra has been edited with a german translation by the scholar who was the first to make a Grhya text accessible to Orient lists and to be gin to grapple with the first and most serious difficulties and to begin to grapple with the first and most serious difficulties that beset its interpretation and who has continued since to do more than anyone else towards elucidating that important branch of Vedic literature. It would be very unbecoming if any one engaged in the study of Grhya texts not to acknowledge most warmly the debt of gratitude which he owes to Prof. Stenzler. At the same time the respect due to the veteran editor and interpreter of Asvalayana and Paraskara not only allows, but requires that one who proposes to himself the same task at which Prof. Stenzler has worked with so much learning should state as clearly as possible what that distinguished scholar has left for others to do and why one who prepares an English translation of Paraskara has a very different task from merely translating into English the German translation of Prof. Stenzler. If I may venture to express in one word the difference between Prof. Stenzler’s method as I understood it for getting at the meaning of a doubtful or obscure passage and the method which I have endeavored to follow. I should say that with Prof. Stenzler the first step and I believe in manu cases also the last step is to ask how Jayarama and Ramakrsna understand the passage in question while I hold that we ought raher to make ourselves independent from those commentators in the sense in which Prof. Max Muller once expressed himself not that I ever despise the traditional interpretation which the commentators have preserved to us but because I think that after having examined it we have a right to judge for ourselves. There exists a commentary on the paraskara Grhya which far surpasses in trustworthiness Jayarama’s Sajjanavallabha and Ramakrsna’s Sanskaraganapati and which is not composed by an author who as say Goethe. But the leaves of that commentary are scattered through a good many volumes. 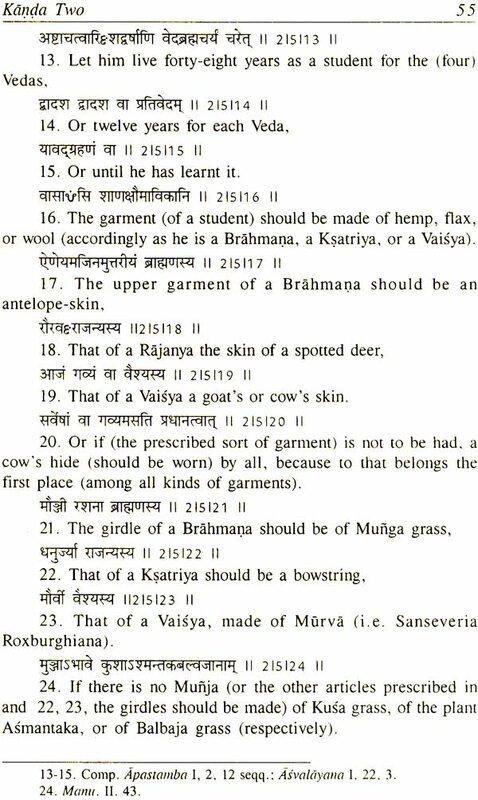 Here we find a few lines of it in the Satapatha Brahmana or in Katyayana’s Srautsutra there Sankhayana or asvalayana has preserved a word or a sentence that belongs to it or the law books of manu or Yajnavalkya help us to understand a difficult or doubtful aphorism of out text. In one word the only true commentary on a work like Paraskara’s Grhya is that which the ancient literature itself furnishes. No one will say that in Prof. Stenzler’s translation and notes this commentary has not been consulted. But it has been perhaps not quite as much as it ought to have been and Ramakrsna and Jayarama have been consulted too much. They have been consulted and followed in many instances, where a continued consideration of what can be the meaning of a word and what cannot and of what the parallel texts say with regard to the subject in question would have shown that those commentators instead interpreting Paraskara’s meaning father on him vague opinions of their own. All ceremonies are performed as at the cooking of the Catusprasya food. 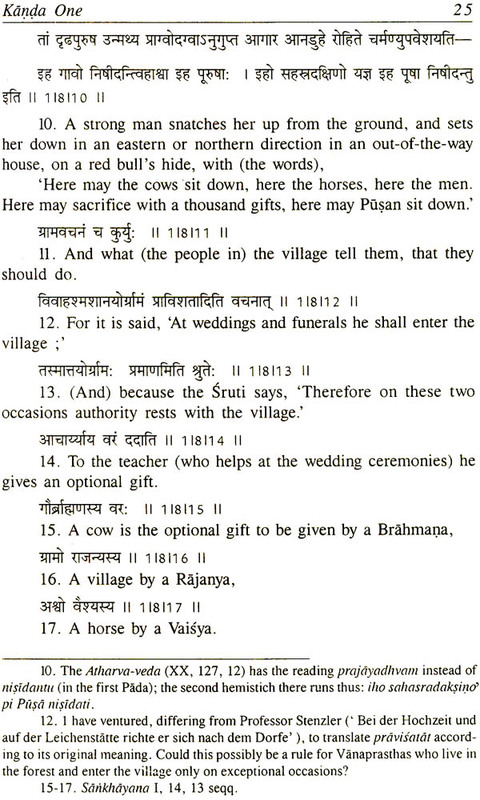 It seems evident that the Acaryas to whom the opinion spoken of in Sutra 5 belongs add or perhaps substitute to the fetching of the fire which is to be worshipped as the sacrifice’s domestic fire from a rich Vaisya’s house another rite in which an arani i.e. a stick for kindling the fire by attrition is made use of in some way or other. Now if this may be accepted as a vague expression of the general purport of the Sutra what is the literal meaning of the words? Some it says the pradana of the kindling stick. That is the word pra stands in the sense of the word upa some teachers desire that it should have the kindling sticks as its physical basis?. Thus if Jayarama is right Prof. Stenzler’s translation would be justified. But can we acquiesce indeed in simply accepting the commentator’s opinion? Pradana is pradana and not upadana as pradadati is not upadatte Pradadati means he hands over and pradana the handing over. This is an established fact and an interpreter of a Vedic text should not allow himself to be induced by a statement like that of Jayarama about the preposition pra standing in the sense of upa to abate one iota of it. Thus we are obliged until passages have been discovered which modify our knowledge of what pradana means but such passages most certainly will never be discovered to translate. Some the handing over of the kindling sticks (takes place). We should give that translation even if we were not able to find an explanation for it. 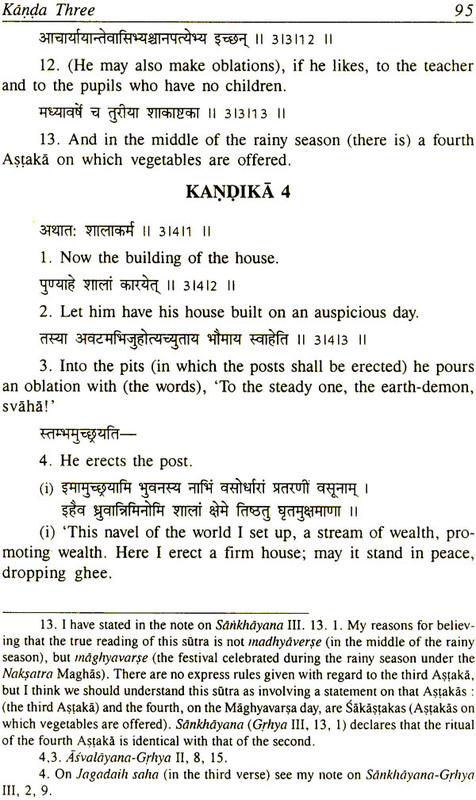 It appears that Prof. Stenzler as far as we can judge from his note has not even thought of the possibility of disregarding the authority of jayarama and Ramakrsna or of looking through the parallel texts to see whether they do not throw light on what that handing over of the kindling sticks signifies. 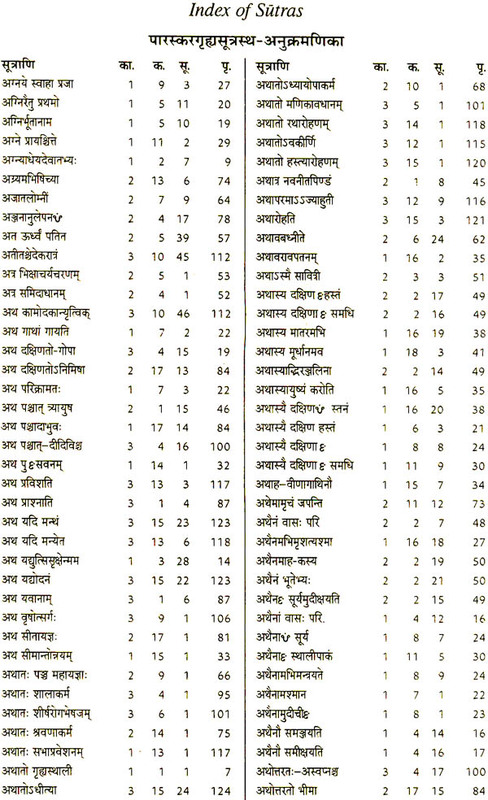 The text to be consulted first is of course Katyayana’s Srautasutra. As the Srauta ritual contains a description of an adhana which in some way the prototype of the corresponding Grhya ceremony we may possibly expect to discover in the course of that description the statements regarding the arani pradana for which we are searching. 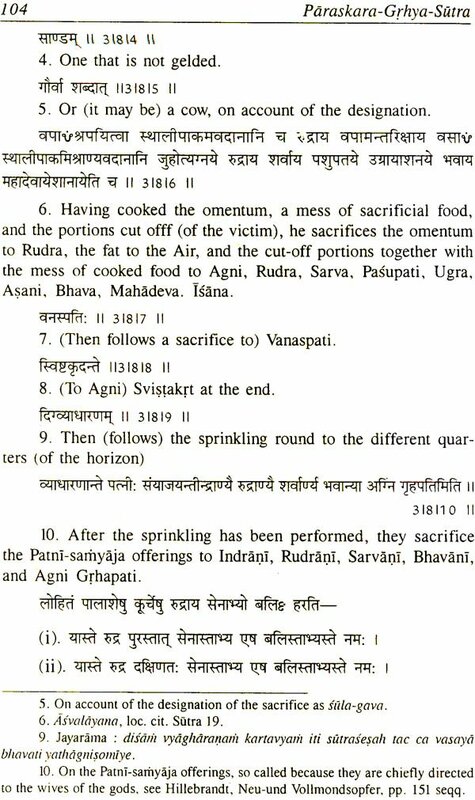 Now Katyayana having described the setting up of the fire in the garhapatyagara states that at sunset the sacrifice and his wife sit down to the west of the fire which has just been established and then the Adhvaryu hands over to them the two kindling sticks. The Paddhati in describing that act goes into further details. The Adhvaryu hands over to the sacrifice the two Aranis which as required by custom are wrapped up in new on her lap the sacrifice puts the uttardrani on his lap and they do homage to them with flowers, Saffron Sandal, wood etc. then after the performance of some other ceremonies they put the two aranis away on a chair or bench. The two Aranis have to be kept by the sacrifice if they are lost or burnt or destroyed in any other way other aranis must be procured and by their attribution a new fire must be kindled. Apastamba likewise mentions in his description of the Agnyaddhana the handling over of the two Aranis and indicates a mantra which the Adhvaryu recities in giving them to the sacrifice and two other Mantras with the one of the which the sacrifice receives them while he recites the other over the Aranis after having taken them into his hands. Finally we may quote here as bearing witness to the custom of the Aranipradana a passage taken from Narayana’s commentary on the Sankhayana Grhya. Though the decisive words in that passage rest only on the authority of the commentator and not of the Sutrakara himself they deserve to be taken notice of as they are not subject to the suspicion that they could be influenced by a misunderstanding of that very Sutra of Paraskara of which we are treating. Narayana says in his explanation of Sankhayana I, To the west of the fire the sacrifice and southwards the wife sits down. The handing over of the kindling sticks does not take place. 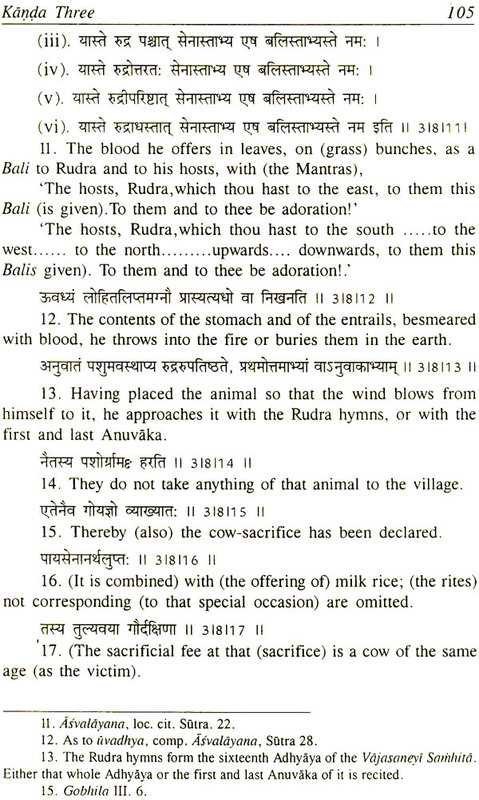 For it is a fire fetched which is inaugurated here then the commentator goes on to quote a sloka. The handing over of the Aranis which the Adhvaryu some time performs.<> Is not in accordance with the opinion of Suyajna he does not approve of kindling the fire by attrition. Thus I think no doubt can remain as to the real meaning of Paraskara’s sutra it means what its words signify and what is in accordance with Katyayana and Apastamba and it does not mean what the commentators most gratuitously would make it mean. Perhaps I have dwelt here too long on the interpretation of a few words which are of no peculiar interest in themselves. But I venture to hope that the discussion on these words will serve as a specimen by which the fundamental difference of two methods of handling our texts may be discerned. Let us never forget how much we owe to the scholars who have followed the first of these methods but for ourselves let us choose the second.